Now Peter was sitting out in the courtyard, and a servant girl came to him. “You also were with Jesus of Galilee,” she said. But he denied it before them all. “I don’t know what you’re talking about,” he said. Then he went out to the gateway, where another servant girl saw him and said to the people there, “this fellow was with Jesus of Nazareth.” He denied it again, with an oath, “I don’t know the man!” After a little while, those standing there went up to Peter and said, “Surely you are one of them, your accent gives you away.” Then he began to call down curses, and he swore to them, “I don’t know the man!” Immediately a rooster crowed. Then Peter remembered the word Jesus has spoken: “Before the rooster crows, you will disown me three times. “And he went outside and wept bitterly. This coming Sunday the elementary children will be reading from the bible these passages in Matthew. They are tough to read but truly relatable. The disciples were unprepared for the events that followed the last supper, but why? They had seen Jesus carry out God’s plan and Jesus had talked to them about future plans. Peter was denying the Lord he had promised never to deny, and all of the disciples who had promised the same thing fled with fear. Peter didn’t realize that following Jesus meant following a Messiah whose kingdom involved the cross. He proved unprepared when the time came to take up his cross and follow the Lord, but his denial caused him great sorrow. Failure happens. 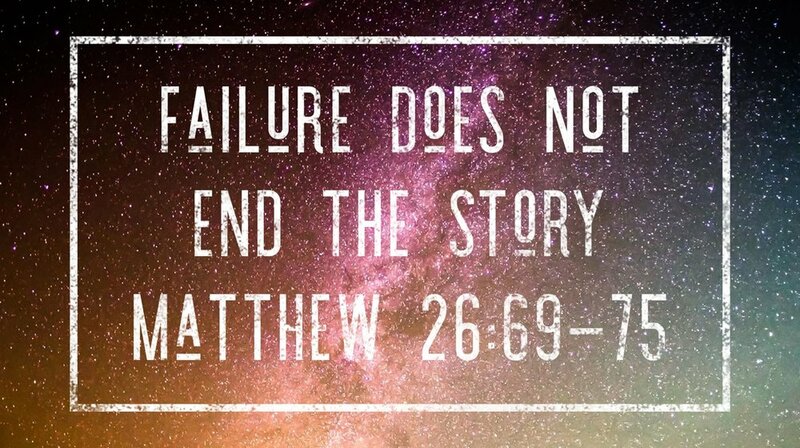 The kids need to know this, but failure does not end the story. Matthew 26:75 presents Peter's response to his failure as an appropriate model for disciples. The exposure of our weakness is cause for repentance. Peter's example challenges us to start fresh if we have failed and show mercy to those who have already failed. There is nothing better each week than opening up the bible to read a story some children might think are “ancient stories” and watch the wonder unfold as each child finds that one person, one story, one moment that speaks to their heart. Note: This post is a highlight of our children’s ministry curriculum from Deep Blue Kids. Please click here from more information about them as well as other resources.